Bismuth subsalicylate, a salt of bismuth and salicylic acid, is the active ingredient in stomach relief aids such as Pepto-Bismol, is the main ingredient of Kaopectate and “displays anti-inflammatory action (due to salicylic acid) and also acts as an antacid and mild antibiotic”. Salicylic acid directly and irreversibly inhibits the activity of both types of cyclo-oxygenases (COX-1 and COX-2) to decrease the formation of precursors of prostaglandins and thromboxanes from arachidonic acid. Salicylate may competitively inhibit prostaglandin formation. Salicylate’s antirheumatic (nonsteroidal anti-inflammatory) actions are a result of its analgesic and anti-inflammatory mechanisms. 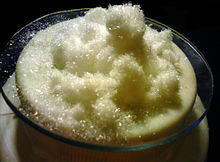 Salicylic acid works by causing the cells of the epidermis to slough off more readily, preventing pores from clogging up, and allowing room for new cell growth. Salicylic acid inhibits the oxidation of uridine-5-diphosphoglucose (UDPG) competitively with nicotinamide adenosine dinucleotide (NAD) and noncompetitively with UDPG. It also competitively inhibits the transferring of glucuronyl group of uridine-5-phosphoglucuronic acid (UDPGA) to the phenolic acceptor. The wound-healing retardation action of salicylates is probably due mainly to its inhibitory action on mucopolysaccharide synthesis. ^ “Front Matter”. Nomenclature of Organic Chemistry : IUPAC Recommendations and Preferred Names 2013 (Blue Book). Cambridge: The Royal Society of Chemistry. 2014. p. 64. doi:10.1039/9781849733069-FP001. ISBN 978-0-85404-182-4. Atherton Seidell; William F. Linke (1952). Solubilities of Inorganic and Organic Compounds: A Compilation of Solubility Data from the Periodical Literature. Supplement. Van Nostrand. ^ “19th WHO Model List of Essential Medicines (April 2015)” (PDF). WHO. April 2015. Retrieved May 10, 2015. ^ a b “Salicylic acid”. Drugs.com. Retrieved 15 January 2017. ^ Madan RK; Levitt J (April 2014). “A review of toxicity from topical salicylic acid preparations”. J Am Acad Dermatol. 70 (4): 788–92. doi:10.1016/j.jaad.2013.12.005. PMID 24472429. ^ “Bismuth subsalicylate”. PubChem. United States National Institutes of Health. Retrieved 24 January 2014. ^ “Definition of Salicylic acid”. MedicineNet.com. ^ a b “SALICYLIC ACID – National Library of Medicine HSDB Database”. toxnet.nlm.nih.gov. Retrieved 2018-08-21. ^ Péc, J.; Strmenová, M.; Palencárová, E.; Pullmann, R.; Funiaková, S.; Visnovský, P.; Buchanec, J.; Lazarová, Z. (October 1992). “Salicylate intoxication after use of topical salicylic acid ointment by a patient with psoriasis”. Cutis. 50 (4): 307–309. ISSN 0011-4162. PMID 1424799. ^ “Salicylic acid”. inchem.org. Retrieved 2008-10-13. ^ “Hydrolysis of ASA to SA”. Retrieved July 31, 2007. ^ Norn, S.; Permin, H.; Kruse, P. R.; Kruse, E. (2009). “[From willow bark to acetylsalicylic acid]”. Dansk Medicinhistorisk Årbog (in Danish). 37: 79–98. PMID 20509453. ^ Goldberg, Daniel R. (Summer 2009). “Aspirin: Turn of the Century Miracle Drug”. Chemical Heritage Magazine. 27 (2): 26–30. Retrieved 24 March 2018. ^ Hemel, Paul B. and Chiltoskey, Mary U. Cherokee Plants and Their Uses – A 400 Year History, Sylva, NC: Herald Publishing Co. (1975); cited in Dan Moerman, A Database of Foods, Drugs, Dyes and Fibers of Native American Peoples, Derived from Plants. 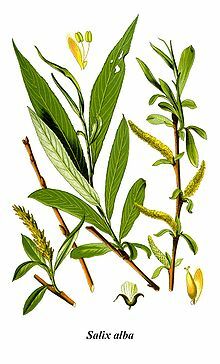 A search of this database for “salix AND medicine” finds 63 entries. ^ “1,300-Year-Old Pottery Found in Colorado Contains Ancient ‘Natural Aspirin‘“. ^ Stone, Edmund (1763). “An Account of the Success of the Bark of the Willow in the Cure of Agues”. Philosophical Transactions of the Royal Society of London. 53: 195–200. doi:10.1098/rstl.1763.0033. Leroux, H. (1830). “Mémoire relatif à l’analyse de l’écorce de saule et à la découverte d’un principe immédiat propre à remplacer le sulfate de quinine”] (Memoir concerning the analysis of willow bark and the discovery of a substance immediately likely to replace quinine sulfate)”. Journal de Chimie Médicale, de Pharmacie et de Toxicologie. 6: 340–342. A report on Leroux’s presentation to the French Academy of Sciences also appeared in: Mémoires de l’Académie des sciences de l’Institut de France. Institut de France. 1838. pp. 20–. ^ Piria (1838) “Sur de neuveaux produits extraits de la salicine” (On new products extracted from salicine), Comptes rendus … 6: 620–624. On page 622, Piria mentions “Hydrure de salicyle” (hydrogen salicylate, i.e., salicylic acid). ^ Löwig, C.; Weidmann, S. (1839). “III. Untersuchungen mit dem destillierten Wasser der Blüthen von Spiraea Ulmaria (III. Investigations of the water distilled from the blossoms of Spiraea ulmaria). Löwig and Weidman called salicylic acid Spiräasaure (spiraea acid)”. Annalen der Physik und Chemie; Beiträge zur Organischen Chemie (Contributions to Organic Chemistry) (46): 57–83. ^ a b c d Malakar, Sreepurna; Gibson, Peter R.; Barrett, Jacqueline S.; Muir, Jane G. (1 April 2017). “Naturally occurring dietary salicylates: A closer look at common Australian foods”. Journal of Food Composition and Analysis. 57: 31–39. doi:10.1016/j.jfca.2016.12.008. ^ Lawrence, J R; Peter, R; Baxter, G J; Robson, J; Graham, A B; Paterson, J R (28 May 2017). “Urinary excretion of salicyluric and salicylic acids by non-vegetarians, vegetarians, and patients taking low dose aspirin”. Journal of Clinical Pathology. 56 (9): 651–653. doi:10.1136/jcp.56.9.651. ISSN 0021-9746. PMC 1770047. PMID 12944546. ^ Race, Sharla (2012). “Salicylate in Food”. The Salicylate Handbook: Your Guide to Understanding Salicylate Sensitivity. Sharla Race. ISBN 9781907119040. ^ “Food Guide”. Salicylate Sensitivity. ^ Sommer, Doron D.; Rotenberg, Brian W.; Sowerby, Leigh J.; Lee, John M.; Janjua, Arif; Witterick, Ian J.; Monteiro, Eric; Gupta, Michael K.; Au, Michael; Nayan, Smriti (April 2016). “A novel treatment adjunct for aspirin exacerbated respiratory disease: the low-salicylate diet: a multicenter randomized control crossover trial”. International Forum of Allergy & Rhinology. 6 (4): 385–391. doi:10.1002/alr.21678. PMID 26751262. ^ “Salicylates in foods” (PDF). Retrieved 2014-05-09. ^ Vlot, A. C; Dempsey, D. A; Klessig, D. F (2009). 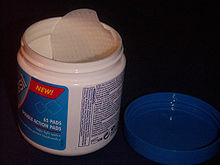 “Salicylic Acid, a multifaceted hormone to combat disease”. Annual Review of Phytopathology. 47: 177–206. doi:10.1146/annurev.phyto.050908.135202. PMID 19400653. ^ Van Huijsduijnen, R. A. M. H.; Alblas, S. W.; De Rijk, R. H.; Bol, J. F. (1986). “Induction by Salicylic Acid of Pathogenesis-related Proteins or Resistance to Alfalfa Mosaic Virus Infection in Various Plant Species”. Journal of General Virology. 67 (10): 2135–2143. doi:10.1099/0022-1317-67-10-2135. English Translation of Hermann Kolbe’s seminal 1860 German article in Annalen der Chemie und Pharmacie. English title: ‘On the syntheses of salicylic acid’; German title “Ueber Synthese der Salicylsäure”.